Everyone has lightbulb moments in their day to day lives. But if you make an extravagant scene to celebrate, folks might think you're just a little off your rocker. Okay, we realize you put that pre-fab furniture together all by yourself without looking at the instructions, but you don't have to tell everyone in the neighborhood about it... they'll think you're a little wacky! Unless you have wild and crazy white hair. Then, that big cry of, "Eureka!" is just kind of expected. If your little guy is the type who likes to figure things out and make his own discoveries, then we've got the exact look for him. He can become a heavy duty "theoretical" scientist when he goes in this crazy costume. 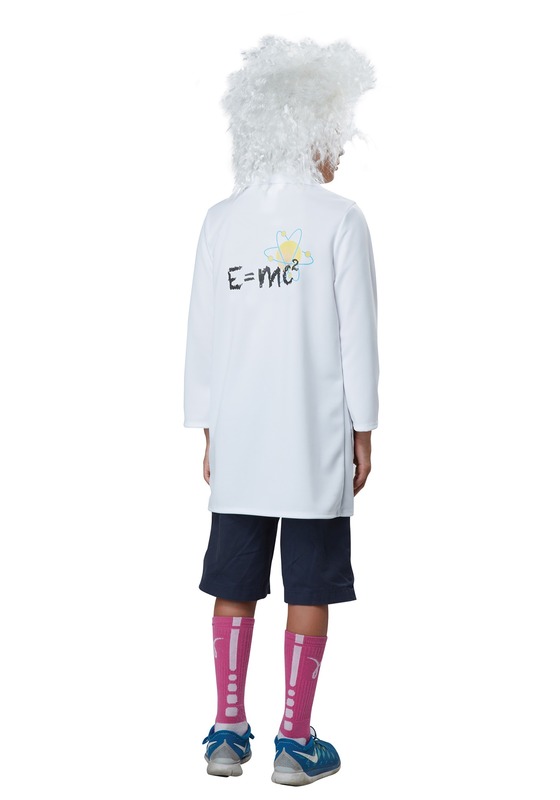 Whether a top-notch physicist who's writing his combined theory or even just a lab coat wearing dude who likes to show off that he's one smart cookie, we're sure any little one will be able to have a fun and imaginative time in this unique costume! It includes a lab coat, wig, and even a mustache to turn any little one into a truly iconic figure. 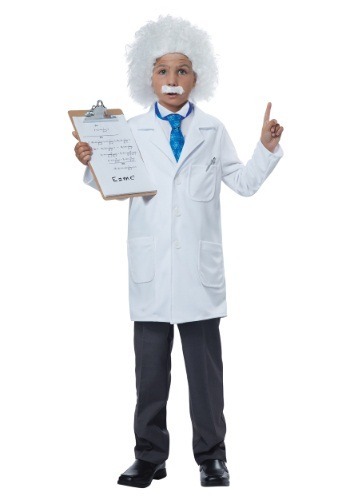 When assembled, this Albert Einstein/Physicist costume will totally transform your little guy or gal into the father of relativity, and with relative ease! A signature mustache secures with self-backed adhesive and matches the white synthetic wig to achieve the character effect. We love the idea of promoting discovery, science, and the incessant question of "why." With this ensemble, any child is sure to have the confidence to follow the evidence to their own conclusions, and perhaps be inspired to one day lead a lecture or to make new discoveries about theoretical constructs on their own. And who knows, maybe E is going to equal something completely different this time!